Yup a mookie would be a muffin-cookie and with loads of better-for-you options like lemon-raspberry, banana-blueberry or pineapple-carrot, I think we are on to something! Aren’t we all looking for ways to get kids to try new foods at lunch? OK fine, they are really like mini pancakes but mookie sounds way more fun! And because you drop dollops of batter onto cookie sheets and bake them, you can skip the time consuming flipping flapjacks step PLUS you can freeze extra for 1-2 months. How many grains do kids need at lunch anyhow? Kids don’t need a lot of grains. TOTAL: 2 of their 4 recommended servings per day. TOTAL: 3 of their recommended 6 servings a day. Of course, you know your child best. Very active kids or kids going through a growth spurt will likely eat more. When you have the oven on, why not bake a sweet potato. It will keep for 3-5 days in the fridge or 10 months in the freezer. Freeze in ¾ cup portions to use in this recipe. Try this Banana-Oatmeal Mookie from my pal, food literacy champion and fellow Food Revolution Ambassador, Susan Ng. She’s the smart mookie who introduced me to this idea. 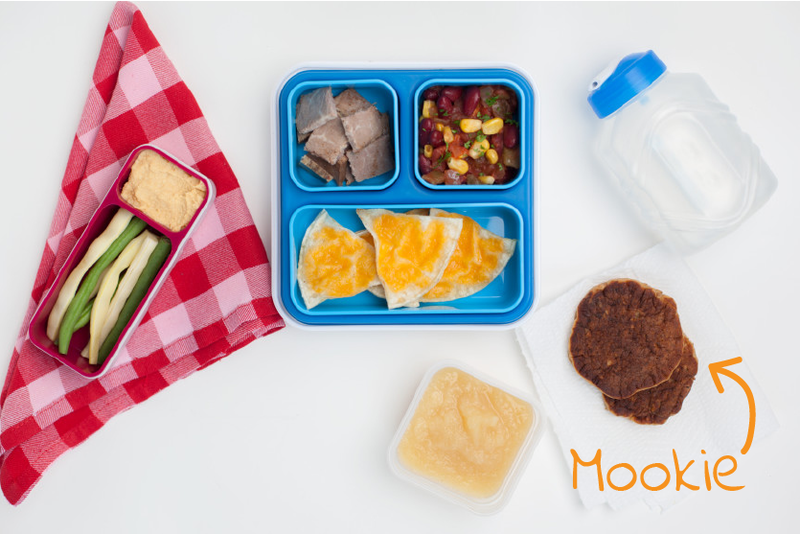 Do you have any other clever ideas to share for packing more vegetables or fruit into our kids’ lunches? Kindly share them here. Dietitian's Tip: Are sweet potatoes and yams the same? No way! Grocers often mix them up selling sweet potatoes with a sign that says yams. Sweet potatoes have orange flesh and deliver 300 TIMES MORE beta carotene (we turn that into vitamin A) than yams which have white or yellow or even purple flesh. You can swap sweet potato for regular potatoes in most recipes. *Kids Cook Young kids can scoop out and mash the sweet potato, crack and beat the eggs as well as learn how to measure flour. Older kids can practice using a grater safely and many will be able to manage most of this recipe with your supervision. Serves: Makes about 20 (2 inch) "cookies"
In large bowl, combine flour, sugar, baking powder, cinnamon, baking soda and salt. In separate bowl, beat together milk, eggs and vanilla; stir in sweet potato. Add wet ingredients to dry ingredients; stir just until moistened. Stir in apple. Using ⅛th cup measure (2 tbsp or heaping tablespoon), drop dollops of batter on to a parchment-lined baking sheet. Bake in 375°F (190°C) oven for about 8-10 minutes or until golden brown. Let cool on racks. * These ideas are meant as a guide only. You know best what your child can safely manage. Make sure they understand your rules for working in the kitchen safely and always supervise kids in the kitchen. ** Barley flour is made from barley so you know it's full of whole grain goodness. 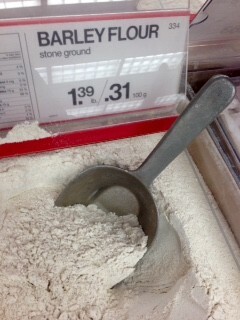 Look for it at bulk food stores or alongside the other flours at your grocer. Visit Go Barley. for more barley recipes.